Addiction is an ugly word. How many of us reach a certain age without knowing someone with drugs or alcohol issues? To many this post might seem harsh, and in advance, I am sorry for that. But I feel very strongly about this and decided to write a little bit about it. If you lived in or around Lower Merion Township at all over the past few decades you were used to it being home to many sports “celebrities”. O.k., while nice, they still have to get up every day like the rest of us. 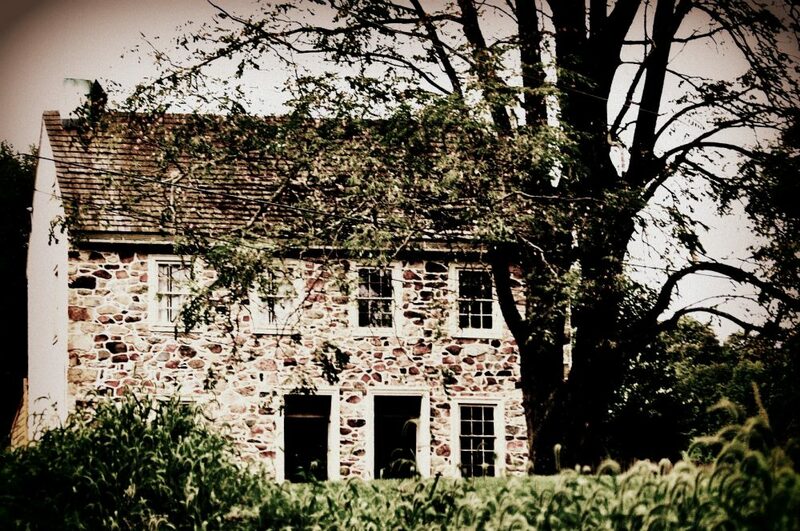 A lot of the sporting celebrities who have lived on the Main Line did it with quiet dignity and not much fanfare. They were part of the community. Some were irritating. Jan. 30, 2007: Any Reid’s two oldest sons, Garrett, 23 at the time, and Britt, 21, are involved in separate incidents. Garrett tells police he used heroin before running a red light in a Philadelphia suburb and striking a car driven by a 55-year-old woman, police say. Britt, meanwhile, in a road-rage incident, points a handgun at another driver, according to police. Investigators recover a shotgun, ammunition, and possible drug residue from the vehicle Britt had been driving, and a handgun from the Villanova, Pa., home where he lives with his parents. Andy Reid and his wife are on vacation. •Feb. 8: Police say Garrett tested positive for heroin after the Jan. 30 accident. •Feb. 15: Garrett is charged with more than a dozen offenses, including assault, drug possession and driving under the influence of a controlled substance. He is released on $25,000 bail, but must complete a drug-treatment program. July 26:Garrett pleads guilty to recklessly endangering another motorist, driving while under the influence and possession of drug paraphernalia. He is released on bail. Andy Reid took a six-week leave of absence in 2007 to (I guess) deal with this. In 2008 he and his wife Tammy did an interview with Philadelphia Magazine. Full on Mormons, and they had a child who was an addict dating back to 2002. I won’t comment further on the article, but suffice it to say I alway felt it had more to do with the parents and their image then troubled kids. When the news broke Sunday that Garrett Reid was dead, I felt sorry for his parents. Figured it had something to do with his addictions and that was pretty much what Andy Reid said in his statement the other day. And yesterday, they buried him out of the Church of Latter Day Saints in Broomall. The funeral was a who’s who of sports and the NFL. 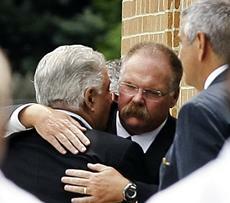 Emotional by all accounts, yet one day after burying his first-born, the Washington Post reports Andy Reid was back with his football team. I don’t mean to be rude or disrespectful or tell someone how to grieve, but I am somewhat shocked he did not take a little more time to be with his wife and family. Or to give his own head a chance to decompress. And maybe that is where I wonder about how this all played out over the years. What if Andy Reid had been dad first and NFL coach second? You see, I have known parents who have dealt with teen and adult addict children and some won the battle and others lost the battle. But in all cases, I remember darn well the time they took and it was family first. I get that his team is an extension of his family, and call me old-fashioned, but I think he should be at home. Substance abuse is a wicked thing. Well over a decade ago I lost a childhood friend to an overdose. I was sad but not surprised when my friend died. I remember seeing him with another friend the week before he died and after we got a good look at him we knew he was using again. I can tell you exactly what I said to him and so can my other friend – I told him I was afraid given his condition he would be dead the next time I saw him, and he was. I remember when another mutual friend told me our friend was gone a couple of days later. It was so sad, it was so hard, yet at the same time in a weird way it was a relief. I mean this kid had had issues dating back to junior high. And his parents and siblings put in the time year, after year. I have no idea all of what they put on hold over the years to deal with this guy’s addiction. You also reach a point in life where you know a lot of alcoholics. I know a lot of people “in the program” so to speak. Some sober long amounts of time, some lesser amounts of time. I know what they went through, what they put their families through, and I know how much work they have done to stay sober. Mind you, I know a couple of people who also have degrees of issues that they have not come to terms with yet. I have found it interesting that a lot of these people in the end are also diagnosed some of the time with depression, bi-polar disorders and other issues – the alcohol in part was self-medication. The people I know in the program work at staying sober every hour of every day. You want to talk about inner strength? These people have it. Yet they will tell you every now and again there is an itch they have to fight tooth and nail not to scratch. So I can’t help but wonder if Garrett Reid had been kept out of the world of professional football, even as the coach’s son, would this outcome have been different? The reason I say that is everyone I know who has had drug or alcohol issues over the years has had to change their lives fairly substantially. They had to do it to eradicate triggers. Now there is also the question of treatment. Garrett had some of the finest money could buy. His parents could afford it. But a lot can’t afford Rolls Royce treatments. I know a lot of people over the years have had very negative things to say about Malvern Institute on King in Malvern, for example. Yikes, just read some of the reviews and your skin crawls. This death of Garrett Reid has provoked a discussion on addictions again, which isn’t a bad thing. And at the end of the day, what happened to Andy and Tammy Reid is every parents’ nightmare. And it can happen to anyone. Addiction doesn’t discriminate. 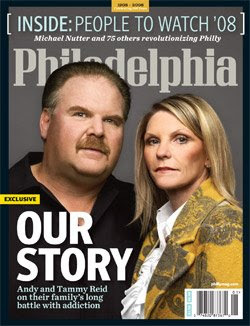 As Philadelphia Eagles head coach Andy Reid copes with his troubled son Garrett’s death, parents redouble their vigilance. A new government study says summer time is the best time to do that as teen drug use surges then. Published: August 06, 2012 4:08 p.m.
Last modified: August 07, 2012 12:35 p.m. This entry was posted in Uncategorized and tagged addiction, alcohol abuse, Andy Reid, death, drug abuse, family, Garrett Reid, life, news by carla. Bookmark the permalink.